rampsmooth~ smooths an incoming signal across n samples. Each time an incoming value changes, it begins a linear ramp of n samples to reach this value. This is useful for envelope following and lowpass filtering. The number of samples is specified either as arguments or with the ramp, rampup, rampdown messages. ramp-sample-pair int opt The number of samples across which to generate a ramp up or ramp down can be specified by a pair of numbers. signal A signal or value to be smoothed. Each time an incoming value changes, the rampsmooth~ object begins a linear ramp over a specified number of samples to reach the new value. 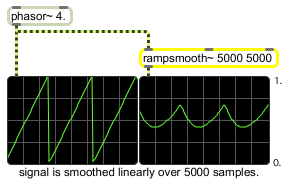 In left inlet: The word ramp, followed by a number, specifies the number of samples over which a signal will be smoothed. Each time an incoming value changes, the rampsmooth~ object begins a linear ramp of the specified number of samples to reach the new value. The default value is 0. In left inlet: The word rampdown, followed by a number, specifies the number of samples over which a signal will be smoothed when an incoming value less than the current value arrives. In left inlet: The word rampup, followed by a number, specifies the number of samples over which a signal will be smoothed when an incoming value greater than the current value arrives. signal: The smoothed signal is sent out the outlet.